Gabrielle Bernstein is our go-to wellness guru in NYC. The teacher, writer, yogi, and life coach always steers us in the right direction for all things wellness. So, when we were looking to get our Zen on this summer, we knew exactly who to call. Plus, we've tapped Dr. Loren Fishman of Manhattan Physical Medicine, author of the forthcoming Healing Yoga, to talk about the benefits your body will get from practicing yoga, too. Ahead, Bernstein's recommendations for the best local yoga spots and all the know-how about why it's good for you. Grab your mat — your brain and your body will thank you. Photo: Courtesy of Golden Bridge. Bernstein recommends Golden Bridge for two major types of yoga: prenatal and Kundalini. "They have incredible prenatal classes along with prenatal teacher training," she says. What's the verdict on prenatal yoga? Dr. Fishman finds that prenatal yoga can make for easier birth on the mother. "Some studies show positive effects on the baby, too. And, a mother and baby can form a special bond," he says. Though each woman should check with her physician first, Dr. Fishman finds prenatal yoga to pose no harm to a pregnant woman. Carmita de Vries, head honcho at Golden Bridge, explains that Kundalini is all about awareness. "It elevates your consciousness through the use of posture, breath, meditation, and sound (mantra). The practice stimulates the glandular and nervous systems, governing all facets of well being — physical, mental, emotional — awakening one's creative energy, to experience themselves at their very best and highest selves," says de Vries. Additionally, Dr. Fishman says that, while Kundalini yoga has no strong physical benefits, "the psychological and spiritual benefits of Kundalini are so great that it doesn't make any difference." Golden Bridge Yoga, 253 Centre Street (between Grand and Broome streets); 212-343-8191. Photo: Courtesy of Integral Yoga Institute. 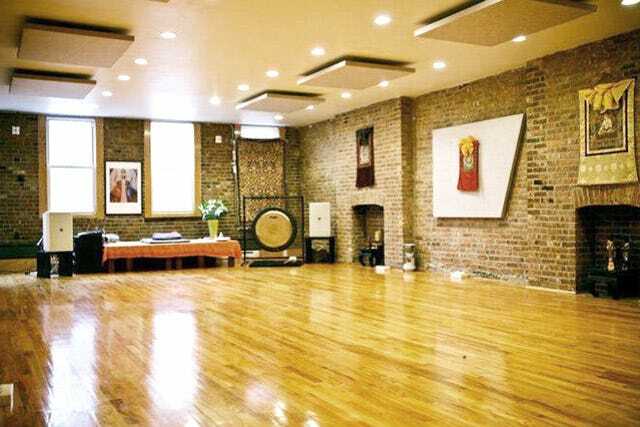 For Hatha yoga, Bernstein loves Integral Yoga Institute in the West Village. "This studio has been around for years and they honor the Hatha movement," says our guru. Hatha consists of postures (asana), breath control (pranayama), relaxation, and cleansing practices (kriyas) meant to strengthen and purify body and mind. "They also offer free group meditations at 12:15 p.m. each day. This is where I grew my meditation practice," says Bernstein. Even more, Dr. Fishman has seen first-hand the physical benefits of Hatha yoga in his patients, having used it as an alternative for rotator-cuff surgery. Not to mention, Hatha's a great introductory practice for any yoga newbies. Integral Yoga Institute, 227 West 13th Street (between Seventh and Eighth avenues); 212-929-0585. Strala yoga is a "movement-based system that ignites freedom," according to founder Tara Stiles. Bernstein thinks this studio is amazing. Strala is about moving away from rigidity into expansive movement and connectedness, the word "Strala" itself is a Swedish word meaning to "radiate light." And, we're not ones to skip out on an opportunity to become more radiant. For the physical advantages, Dr. Fishman spoke to the potential benefits of some common poses Yoga can help you lose weight and reduce stress levels (the hormone cortisol has been linked to increased belly fat), he explains, noting that the Natarajasana pose (or dancer's pose) in particular in Strala could be beneficial. Strala Yoga, 632 Broadway (at Bleecker Street); 917-488-7195.